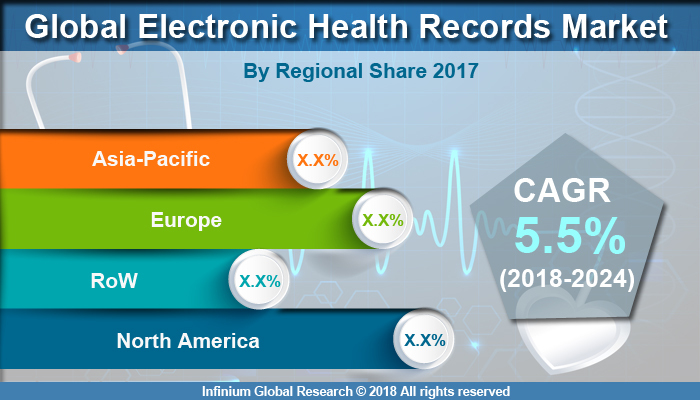 A recent report published by Infinium Global Research on electronic health record market provides in-depth analysis of segments and sub-segments in global as well as regional electronic health record market. The study also highlights the impact of drivers, restraints, and macro indicators on the global and regional electronic health record market over the short term as well as long term. The report is a comprehensive presentation of trends, forecast and dollar values of global electronic health record market. According to the report, the global electronic health record market is projected to grow at a CAGR of 5.5% over the forecast period of 2018-2024. An electronic health record (EHR) is a digital version of a patient’s electronically stored health information. These systems are real-time, patient-centered records that make information available instantly and securely to authorized users. One of the key features of an EHR is that health information can be created and managed by authorized healthcare providers in a digital format. This information is capable of being shared with other providers across more than one healthcare organization. The benefits of electronic health records include better health care by improving all aspects of patient care, including safety, effectiveness, patient-centeredness, communication, education, timeliness, efficiency, and equity. The use of electronic health records offers many clinical advantages such as fewer medical errors, easier access to clinical data, ability to establish and maintain effective clinical workflows and No bulky paper records to store, manage and retrieve, these aforementioned factors drive the growth of the electronic health record market. The rise in the adoption of the electronic health record, increased use of cloud-based EHR software, the rapid surge in aging population, and subsequent rise in the number of chronic diseases to boost the electronic health records market growth. However, the market growth is limited by the high cost of Electronic health record and rise in concerns regarding the patient data safety & security due to increase in cyber-crime. This, in turn, is curtailing the growth of the electronic health record market. Conversely, the huge market potential in the developing regions and the introduction of technologically advanced software is expected to offer further opportunities for market growth during the forecast period. Among the geographies, North America held the largest share in the electronic health records market. Europe and the Asia Pacific are also among the leading contributors of revenue to the global EHR market. The e-Health market has evolved as one of the fastest growing U.S. industries and remained almost unaffected even post-recession scenario. The Asia-Pacific is witnessing the increasing adoption of EHR across hospitals, physician offices, and other healthcare centers and is driven by the presence of a large pool of patients. Emerging economies in the Asia Pacific region including China and India have been experiencing strong economic growth. The report on global electronic health record market covers segments such as type, deployment, and end user. On the basis of type, the global electronic health record market is categorized into acute electronic health record, ambulatory electronic health record, and post-acute electronic health record. On the basis of deployment, the global electronic health record market is categorized into web-based, client-server based and software as services. On the basis of end user the global electronic health record market is categorized into the hospital, physician clinic and diagnostics center. The countries covered in the North America region include the U.S., Canada, and Mexico; while the Asia-Pacific region includes countries such as China, Japan, India, South Korea, Malaysia, and among others. Moreover, Germany, U.K., France, Spain, and Rest of Europe are the major markets included in the European region. The U.S. drives the growth in the North America region, as it is the largest market in the region. In the Asia-pacific region, rapid industrial growth in India and China offer a substantial potential for the growth in the electronic health record market. As a result, the APAC region is projected to experience a growth at a CAGR of x.x% over the forecast period. The report provides profiles of the companies in the global electronic health record market such as, Epic Systems Corporation, McKesson Corporation, Allscripts, GE Healthcare, Cerner, CPSI, Medical Information Technology, Inc., Computer Sciences Corporation (CSC), Greenway Health, LLC and eClinicalWorks. The report provides deep insights into the demand forecasts, market trends, and micro and macro indicators. In addition, this report provides insights into the factors that are driving and restraining the global electronic health record market. Moreover, The IGR-Growth Matrix analysis given in the report brings an insight into the investment areas that existing or new market players can consider. The report provides insights into the market using analytical tools such as Porter's five forces analysis and DRO analysis of electronic health record market. Moreover, the study highlights current market trends and provides forecast from 2018-2024. We also have highlighted future trends in the electronic health record market that will affect the demand during the forecast period. Moreover, the competitive analysis given in each regional market brings an insight into the market share of the leading players. This report will help manufacturers, suppliers, and distributors of the electronic health record market to understand the present and future trends in this market and formulate their strategies accordingly.